So, everyone wants to go on a vacation, even the band, the Go-Go’s, as heard in their song, simply titled…”Vacation”! However, with gas prices and flight costs rising, taking a simple summer vacation has gotten to be a lot more expensive. Add in paying for meals and entertainment and say goodbye to even more of your hard earned money. Oy vey…what a headache! Why not forgo all that stress, save some money, and instead have a Staycation in your very own home! Merriam – Webster defines a Staycation as “a vacation spent at home or nearby”. Turn your home and backyard into an outdoor oasis that everyone in the family will enjoy. Think about how a hotel is set up and organize your home as such, for the whole summer or even for just a week! Set up an island or part of a countertop for a breakfast buffet/snack bar like you would find in a hotel chain. Set out those single serve cereal boxes, some fruit and granola bars; maybe even whip up a large amount of pancake batter. Buy an inexpensive waffle maker and you can have fresh waffles every morning! Since you are saving money by staying at home, splurge a little here. Find melamine dishes and bowls and acrylic cups, and stash your everyday dishes and cups up on a higher shelf. Tie them together with a bright tablecloth and you have a fresh new look. When you decide to eat al fresco, just take those items outside! After a nice breakfast head outside for the next phase of the day. If you are in the mood to relax then set yourself up on your patio or lawn. Put on some music, bring out your favorite books and/or magazines, and even work on a hobby that you’ve been neglecting. Keep a cooler filled with your favorite beverages and you’ll be set! If you are in the mood to get out of the house, then use those at home days to figure out where to go. If you don’t have a pool at your home or community, consider a membership to a local pool. Or maybe you’d rather go shopping; an outlet center is a great way to spend a day and most offer coupons for additional savings. Another idea is to become a tourist in your own city. So often, our lives get so busy that we can’t appreciate the historical areas and landmarks that our own city has to offer. Use as a sanctuary to rest and recharge after a busy day outdoors. Put crisp linens and a light comforter on the bed in soothing beach colored neutrals. Try to keep it as a technology free area, which shouldn’t be too hard, because most TV shows are on reruns! Keep a book on your night table and read that instead. However you decide to spend your Staycation, take the time to savor every minute of the day. Push aside obligations and expectations and put the focus on you. You deserve it! To minimize the amount of clothing, shoes and accessories, pick a color scheme of one or two colors. One of my favorites is black & tan. Many neutral clothing items can be dressed up or down — depending on what is partnered with them. For example, a simple black sun dress can be worn with flip-flops during the day, then dressed up with a summer scarf, kitten heels and sparkly earrings for a night on the town. Calculate how many outfits you’ll need for the number of days of travel. How many items can you wear more than once, such as jeans or dress clothes? For extended trips, are you willing to do hand washing or utilize the hotel’s laundry service? What about shoes? Try to limit them to three pairs. Once you’ve done the math, make a list of what you are considering. Create a checklist in Word, Excel or on paper. List the basics, then add selections for summer, winter, business or an extended trip. It will save you time and reduce angst! What will the range of temperatures be at your destination? Closer to the date of travel, check the ten-day forecast. What if it rains unexpectedly; is cold or hot? Add raincoats, umbrellas, sweaters, shorts, etc. and remember that LAYERING is in order for chillier weather. Many people bring a number of options for each day so they can wear what they’re in the mood for. Not! If you want to streamline your packing, don’t let your mood come into play. Select an outfit for each day, less what you’ll repeat, plus what’s needed for unexpected weather. Add an extra set of undies, socks and top in case of an unexpected delay. When in doubt …. leave it out! To roll or not to roll…that is the question. There’s a lot of debate about the best way to pack a bag for travel. We’ve used three different methods with our clients. The best method depends on the purpose of the trip, the kind of clothing you are taking, if you prefer hanging your clothes at your destination and wrinkle control. In the layering or bundling method, layer the clothes in a crisscross fashion in the suitcase and intertwine them into a bundle. This is a great method to reduce wrinkles and we were easily able to pack as many as 25 items of medium sized women’s clothing in one 22” carry-on. The downside is that the entire bundle has to be removed and unwrapped to retrieve your clothing. Rolling the clothing is another popular method. You can roll each item individually or group like items together and roll as a bundle. We found that grouping like items together does save some extra space and reduce some of the wrinkling that can occur with various fabrics when rolled. And finally, the folding method. This method does take up more space than layering or rolling. However, for some fabrics, it’s a better way to reduce wrinkling. Folding the clothing with a piece of tissue paper or plastic in the middle will reduce friction and therefore the wrinkles. In the end, we found that a combination of methods often works best. Rolling items that don’t wrinkle easily and folding others with plastic were the easiest techniques to combine. Once the larger, bulkier items were placed in the suitcase, we filled in all the gaps with smaller items like underwear, tank tops, bathing suits and belts, so that every nook and cranny was filled. When you are at a restaurant, in the car, or headed to the beach, do your children drive you crazy by fighting or by saying that they are bored? I have found several variations of a ‘busy bag/box’ on Pinterest, and decided to create my own. My bags have changed over the years accommodating items that will satiate my 4 year old as well as my 7 year old! When my children were toddlers, I used to pack lots of board books, large Duplo blocks, finger puppets, Crayola dough, laminated play dough mats, stacking cups and Fisher Price plastic animals. For older children, add Legos, playing cards, trivia questions, the game Uno, books, Mad libs, and maze books. Books on CD from our local library, or Conference CD’s from the NAPO-GPC library! A fun idea that I started — on a 10 hour trip to Myrtle Beach — was to get baby links from the dollar store and connect them from one car hook to the one across from it in the backseat, and a super hero traveled link to link every hour that passed. 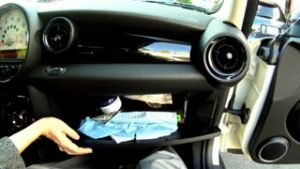 Also, since each of my children had a small version of the car bag next to them, with each activity organized inside a smaller container, there were no melt downs! Taking a family of four to the beach is like a jigsaw puzzle. Everything needs to be organized and in a certain area or else it will be covered in sand or forgotten. Thanks to many invites to Thirty One parties I am well prepared for the beach with bags! Staying organized, even on vacation, helps to keep my sanity, as well as my husband’s when the ice cream man rings his bell and both children start running towards him. All he has to do is reach in the pouch for the money and not waste any time looking for it. I hope I have inspired you to create your own “Bags” for whatever situation calls for it. Have fun and safe travels this summer! 20 Organizing Tips to Help You Pack Your Suitcase Like a Pro! Know the climate, weather and temperatures of the location you will be visiting as this will determine the types of attire and accessories you will need. How long will you be there? This will determine the amount of clothing and accessories you will need. 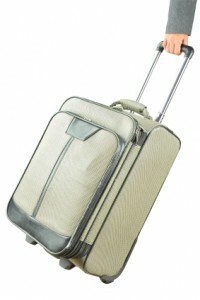 If you are traveling by air you need to decide if you will be using carry-on baggage or if you will be checking bags. Remember this choice may affect your toiletry choices due to various airline restrictions. Now put together daily outfits and undergarments based upon the amount of days you will be gone. Add an extra 2-3 days of additional attire for emergencies. To keep clothes at a minimum consider a wardrobe that is easily coordinated with mix and match items. For example, jeans, black, white and tan separates can make for a variety of different outfits. Begin by appropriately folding these items and stacking them in piles. This will serve two purposes. One is so they are ready to be put into the suitcase, and two is to get a visual of the amount of luggage space and pieces that will be needed. Next, decide if you will need any specialty items; dinner or formal attire, rain gear, sweaters or jackets for potential cooler temperatures, hiking gear, etc. and gather these items. Fold and stack them for packing. Decide what types of shoes you will need. Do you need walking shoes, dress shoes, any specialty shoes such as boots, or flip flops? Do not bring all of your shoes; decide which ones will be the most universal to your needs. Now you can decide if you need accessories such as additional outerwear; hats, scarfs, sunglasses, etc. and put those items with your piles of clothing to be packed. Gather your necessary personal toiletry items with regard to if you are checking bags or using only carry-on and make sure you are following your airline carrier’s guidelines. It’s a good idea to use a small travel or cosmetic bag or clear plastic Ziploc bags for packing toiletries. If the airlines do want to view these items it is easy to see them, and if any would leak or spill, it will help safeguard your clothing. Once you have all of your items stacked in front of you for packing, now you can see what size luggage or how many pieces of luggage you will need for the job. Arrange your shoes in with top sides together but opposite each other front to back; one shoe toe should be facing into the heel of the other shoe for the best fit. Place them in shoe covers if you have them or use white plastic bags to keep the soles of your shoes from touching your clothing and your suitcase lining. 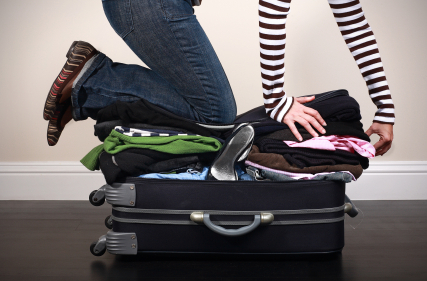 Pack shoes in the bottom or sides near the bottom of your suitcase. Next, place your larger items such as jeans, pants, jackets, etc. in the suitcase and take advantage of the length of the suitcase. (some may need to slide under the shoes, you’ll have to see) Know that you may need to double fold some items to fit properly. Rolling your clothing is another option to folding it and often avoids unwanted travel creases. Begin to fill in the suitcase with your pre-folded clothing or rolled clothing, filling the sides with smaller items like undergarments, socks, accessories and even those toiletry bags. The trick to keeping your items neat and orderly is to put them in the suitcase neat and orderly and fill spaces with smaller items so there is less opportunity for shifting. By packing the more delicate items closer to the front of the suitcase, the weight of the other clothing is not on them at least during the period you are in control of your bag. Don’t forget to bring along some laundry bags or mid-size plastic bags to keep your dirty clothes separate in the suitcase as you travel. Do not over stuff your bag! 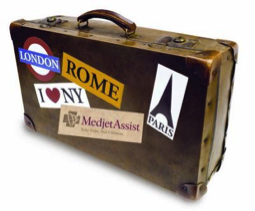 If you can barely get your suitcase closed from the start, it will be even more challenging later. You will either need another bag or you will need to make some strategic elimination choices from your original selection of clothing and accessories. Use the straps within your suitcase to help keep your clothing from shifting. 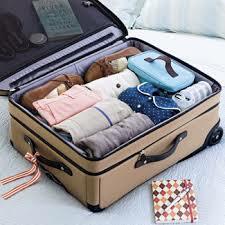 Check and adjust so that everything appears to be evenly packed within the suitcase. Now zip your suitcase and go! Bon Voyage!